Dr. Ron Hooley is a general practitioner with advanced certification in Canine Rehabilitation and a co-founding veterinarian of River Trail Animal Hospital. He has been practicing veterinary medicine since 1989. A native of Poteau and then Edmond, Oklahoma, Dr. Hooley says his family was among the original Oklahoma homesteaders during the Land Run of 1889. "I spent summers working on my family's farm in the panhandle of Oklahoma, where I developed a love of caring for and treating the animals," he says. "In high school, I began working for a veterinary practice in Edmond. I spent most of my days in the kennels taking care of pets, but loved being around the veterinary practice. I eventually advanced to veterinary assistant in the hospital and spent time assisting in surgery. I felt then that I had found my true calling and began my efforts to go to veterinary school." For his undergraduate studies Dr. Hooley attended Oklahoma State University where he worked for all four years in the Animal Nutrition Department as a laboratory assistant and earned Honor Roll every semester. In 1985 he graduated with a Bachelor of Science in Animal Science. Later that year he entered Oklahoma State University's Center for Veterinary Health Sciences. He graduated with a Doctorate of Veterinary Medicine in 1989. 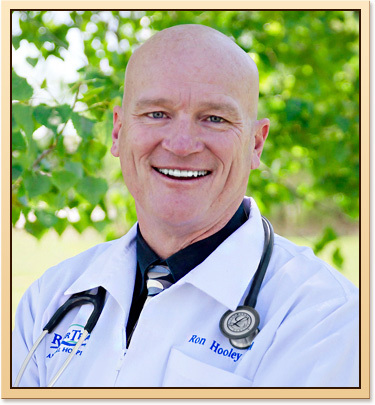 Dr. Hooley's areas of professional interest include internal medicine and gastroenterology. In 2009 he earned accreditation in Canine Rehabilitation. Now that he's a veterinarian, Dr. Hooley says, "Just like the first week I ever walked into a veterinary office, every time I go into the clinic I'm excited to see all the patients and their owners. I love the happy patients I get to see every day." Dr. Hooley's personal interests include racing road and mountain bikes – he was the Oklahoma State Champion in 2004 and 2005 – as well as sailing and camping. Dr. Hooley and his wife Barbara have a son named Jon and a daughter named Katie. Both enjoy sailing and taking acting classes. In fact, both were featured in a television commercial in 2010. Additionally, Dr. Hooley's son has been accepted to attend college at Oklahoma State University, and plans to pursue a career in veterinary medicine, as well! 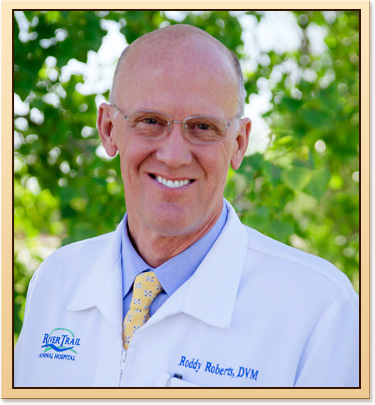 Dr. Roddy Roberts is a General Practitioner and co-founder of River Trail Animal Hospital. A native of Tulsa, Dr. Roberts says, "I grew up in a mixed rural/urban environment, but I was always outdoors. I also spent some summers with my grandfathers – one had a farm in Texas and the other a ranch in Colorado – so I spent quite a bit of time around livestock as well as our many household pets, which made it seem like the natural thing to want to spend my life around animals and caring for them. From wildlife to the family dog, the attraction has always been strong, and watching the joy people get from their companion animals made me want to be part of that." Dr. Roberts attended Oklahoma State University for his undergraduate studies where he earned a Bachelor of Science in Biomedicine in 1982. Concurrent to entering veterinary school at Oklahoma State University's Center for Veterinary Health Sciences, he joined what he describes as the "club of happily married with children and a business on the side." The side business was a landscaping and irrigation company that helped him through veterinary school. Dr. Roberts also owns a small cabinet making business. In 1986 he graduated with a Doctorate of Veterinary Medicine. Dr. Roberts' areas of professional interest include allergy, internal medicine, and surgery. He also holds postgraduate training in hepatic and pancreatic diseases. Now that he's a veterinarian, Dr. Roberts says, "I really enjoy striving to make the life of your pet the healthiest and happiest it can be. I love continually learning and growing as a veterinarian. The trust you give me is one of the greatest gifts I can receive." He and his wife Joanie have two daughters named Miranda and Hannah, both are married, and a son named Boone. The family also has a Maltese named Isabella. Dr. Roberts interests include cabinet making and woodworking. He adds, "My deepest drive is to serve God and others as a Christian man." 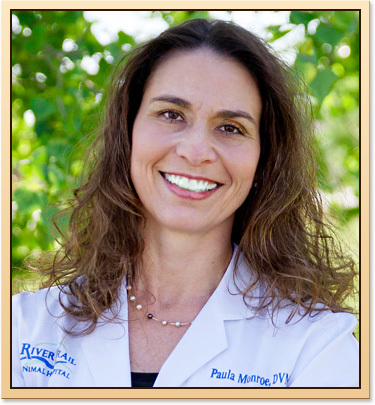 Dr. Paula Monroe made a decision in high school that she stuck to, and that was to become a veterinarian. It was a great choice. Dr. Monroe was named Veterinarian of the Year by the Tulsa Humane Society in 2007, and was featured in the Tulsa People Magazine pet issue in 2008 and 2009. "I knew from a young age that I wanted to be in the medical field in some way," she said. "I decided in high school because of my love for animals." Dr. Monroe grew up in Kiefer, Oklahoma. "We always had animals of all kinds, from the traditional dogs, cats, chickens and turtles to the not-so-common, including a crow named Crawford and a squirrel named Curley." Right after high school she worked at Jenks Veterinary Hospital as a kennel technician her first summer out of high school. Dr. Monroe earned an Associate's Degree from Northeastern Oklahoma A&M College and went on to earn her undergraduate degree from Oklahoma State University in Agricultural Sciences and Natural Resources in 1993. She was named an Oustanding Alumnus at her college's 2015 alumni conference. "Each summer home from college I worked at a veterinary hospital, including Jenks, Alta View and Veterinary Medical Center, all of which were in the Tulsa area," she said. In 1996 she earned her DVM from the College of Veterinary Medicine at Oklahoma State University. While in school Dr. Monroe was elected President of the student chapter of the American Association of Feline Practitioners (AAFP), and she received a proficiency award from the AAFP in feline medicine and surgery during her senior year. Dr. Monroe has a special interest in feline medicine and surgery, pain management, geriatrics and hospice care. "People seem to feel so helpless when their pet is sick or hurt. It's a great feeling to be able to alleviate some of that anxiety and help the owner make their pet well again," Dr. Monroe said. "I also really enjoy helping people take care of their elderly pets so they live as long as possible and are comfortable, happy and healthy in their senior years." Dr. Monroe is a member of the American Association of Feline Practitioners, the American Association of Veterinary Medicine, the Veterinary Information Network, the Tulsa County Veterinary Medical Association, the American Veterinary Medical Association and the International Veterinary Academy of Pain Management. She has completed the North American Veterinary post-graduate Institute in the following disciplines: Feline Medicine and Emergency Medicine and Critical Care. She has completed training in the Advanced Feline Dentistry and Oral Surgery at the Animal Dental Training Center and an advanced course in Feline Ultrasound at Sound Technologies. Dr. Monroe is active in the American Association of Feline Practitioners. She was on the board of AAFP from 2012-2016 and was the chair of the national welfare committee from 2011-2016. She participated in the subcommittees that created position statements on "Environmental Enrichment for Cats", "Hospice Care In Cats" and "The Use of Positive Reinforcement for Desired Behavior in Cats", which have each been published in the AAFP Journal. Dr. Monroe is the current President-elect of the AAFP and will serve as president in 2018. Dr. Monroe and her husband Jeff share their home with three cats named Slinky, Amazing and Braille. Braille was born blind and "she has taught me more about feline behavior than any book." Dr. Monroe enjoys working out, mountain biking and spending time at the lake with her husband. She is a member of the Calvary Baptist Church of Inola. She joined River Trail in April of 2012. 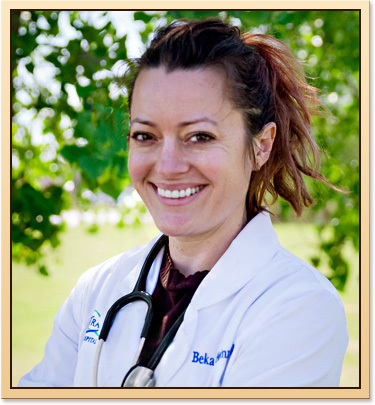 Dr. Beka Heinz's love of animals was evident early on during her childhood in Tulsa, Oklahoma. "Even as a young child I was obsessed with animals," she recalls. "I would rehabilitate injured turtles, birds, and rabbits and adopted every puppy and kitten I could get my hands on. When my parents couldn't find me, they would walk to our neighbor's horse pasture to look for me." 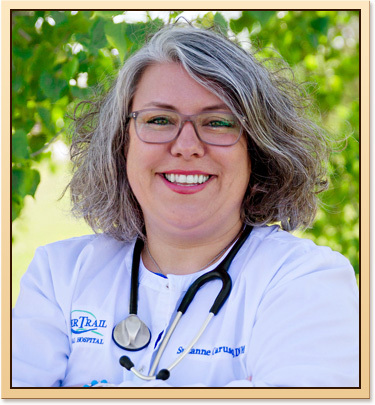 After attending high school in both New Jersey and Oklahoma, Dr. Heinz attended the University of Tulsa, where she received her bachelor's degree with honors in biology in 2004. Following college, veterinary school an obvious choice. "There was literally nothing else I wanted to do," she says. "I feel as if I was born to care for animals." She earned her Doctorate of Veterinary Medicine from Oklahoma State College of Veterinary Medicine. While there, she was a Sitlington Scholar and received an Alice Levin Endowment award. Dr. Heinz joined River Trail Animal Hospital in 2014. She is a member of the Oklahoma Medical Reserve Corp and is the veterinarian for the Oklahoma Highway Patrol. Her professional interests include surgery, animal welfare, and internal medicine. She participated in the National Institute of Health's competitive summer research program, and her research is still used and has been published in several papers. The love of animals and complete dedication to their care that led Dr. Heinz to pursue a career in veterinary medicine continue to guide and motivate her today. "My pets are my best friends, and I think our pets should be treated as such," she says. "There is no better feeling than alleviating an animal's suffering, or preventing disease or pain from occurring." At home Dr. Heinz cares for three cats: Wee, who is blind and deaf, Hank, and Lucius; four dogs: Lilly (a German short-haired pointer), Moose (a loveable mutt), Skrimp Bait (a fox terrier), and Stewart (a collie mix); and a gecko named Ulysses. She is married to Barry "the Dream" Weaver and together they have a daughter named Hayes. In her free time, she enjoys kayaking with her dogs, running, local music, hanging out with her family on their front porch swing, and brewing beer. Oklahoma native Dr. Angela Merideth has known she wanted to pursue a career as a veterinarian for a long time - so long, in fact, that she can barely remember it as a conscious decision. "I was one of the fortunate people to have been blessed with always knowing I wanted to be a vet," Dr. Merideth explains. She spent large portions of her early years outdoors, interacting with animals and developing her passion for working with and helping to care for them. "My grandmother and uncle had a farm when I was young where I spent time on the weekends and in the summer." She attended Oklahoma State University as an undergraduate, studying Biological Sciences. 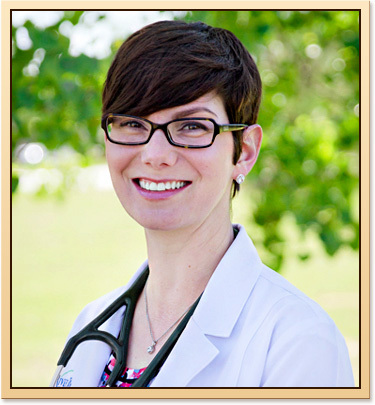 Dr. Merideth gained her doctorate in veterinary medicine from the Oklahoma State University Center for Veterinary Health Sciences, graduating in 2005. During her time in veterinary school, she received the Pfizer Veterinary Specialty Team Award for excellence and clinical proficiency in internal medicine during her fourth year. 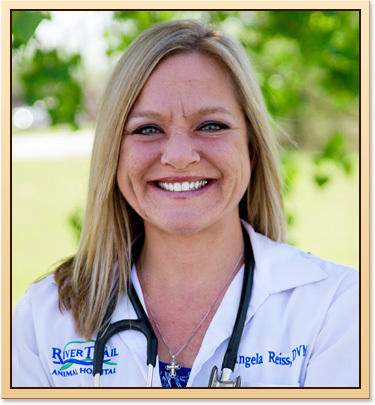 Dr. Merideth began practicing as a veterinarian in Bixby in 2005 and merged with the River Trail team/practice in 2013. 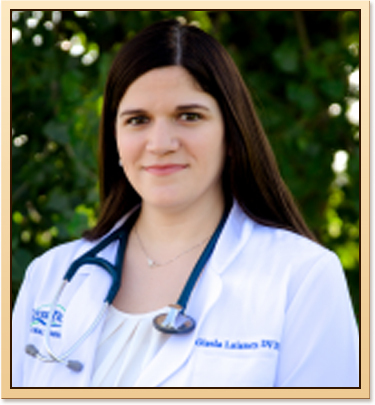 As a veterinarian, her professional interests mainly reside within the world of internal medicine, particularly endocrinology and oncology. Dr. Merideth is a member of the Oklahoma Veterinary Medical Association, the American Veterinary Medical Association, and previously served on the board of the Tulsa Veterinary Medical Association for a period of several years. Since joining the team at our animal hospital, Dr. Merideth has continued to find the perfect mix of personal fulfillment and professional growth. "I love having the opportunity to integrate my love for animals, science, and communication with people into a profession in which I can learn something new every day," Dr. Merideth explains. In her free time Dr. Merideth enjoys watching football, horseback riding, snorkeling, and spending time at the lake. She has a son and a daughter, both of whom have graduated high school and are now pursuing higher education. Dr. Merideth also actively attends church at Battle Creek. For as long as she can remember, Dr. Copeland's mother—a former veterinary technician—instilled a love of animals and medicine in Dr. Copeland in their Yukon, Oklahoma home. From a young age, she knew that she wanted to be a veterinarian, but was afraid that certain aspects of veterinary medicine would be emotionally difficult to deal with. As she got older, she considered marine biology as an alternative. All this changed in high school when her family took in a puppy named Rocky whom, unbeknownst to Dr. Copeland and her family, had serious health issues. She and her family worked closely with their veterinarian to treat Rocky, but he unfortunately passed away. The heartbreak Dr. Copeland felt after Rocky passed was accompanied with a surprising sense of peace. She knew they had done everything humanly possible, had alleviated Rocky's pain and suffering, and had given him a wonderful—albeit short—life. Rocky's passing eventually gave her the push to become a veterinarian. Her earlier fears were silenced as she learned that there will be sad times and that she will not be able to cure every patient, yet there will always be something that she can do to help every animal she meets and their humans as well. After high school, Dr. Copeland attended the University of Oklahoma where she received her bachelor's degree in zoology. While an OU, Dr. Copeland was an Oklahoma State Regents' Academic Scholar and an OU President and Dean's Honor Roll student. For her academic excellence, she was acknowledged by the National Society of Collegiate Scholars and the Golden Key Societies. After her undergraduate studies, Dr. Copeland went to Oklahoma State University College of Veterinary Medicine where she earned her Doctorate of Veterinary Medicine in 2011. While at veterinary school, she was on the OSU Center for Veterinary Health Science President and Dean's Honor Roll. Dr. Copeland is a "self-described nerd." She enjoys embracing the challenge of learning new things in order to keep up with the ever-evolving and improving field of veterinary medicine. She says, "It is never dull and I get to practice such a broad spectrum of medicine from pediatrics, geriatrics, wellness, surgery, emergency, endocrinology, radiology, ultrasonography, and so much more." Her intense curiosity comes with the added benefit of meeting a variety of interesting, caring pet owners and their equally amazing, loving and entertaining fur children along the way. A member of the Oklahoma Veterinary Medical Association and the American Veterinary Medical Association, Dr. Copeland's greatest professional veterinary interests are internal medicine, ultrasonography and preventive medicine. Dr. Copeland and her husband, Brock, share their home with her stepdaughter Joslyn, a 5-year-old female Great Dane named Hera, a 3-year-old male pit bull named Loki, and a 5-year-old domestic short hair named Horace. In her free time, Dr. Copeland enjoys swimming, scuba diving, reading, riding four-wheelers with her husband, playing with her step daughter Joslyn and her niece and nephew Maci and Caleb, going to the movies and competitive pole dancing. She recently placed first at the Colorado Pole Championship 2016 Doubles Division. 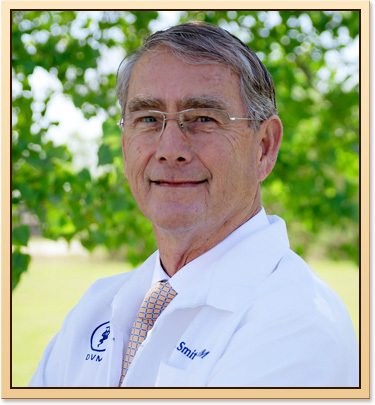 Dr. D.C. Smith has been practicing veterinary medicine for over 40 years. He joined the veterinary team at River Trail Animal Hospital in July 2016. Dr. Smith is a member of the American Veterinary Medical Association, the Oklahoma Veterinary Medical Association and the American Animal Hospital Association. 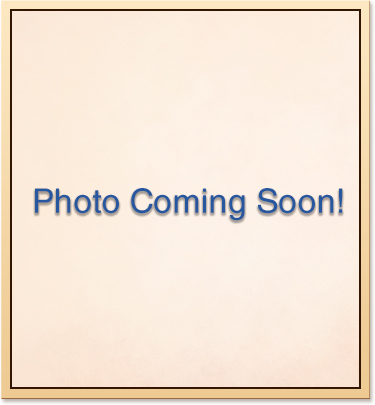 His main professional interests are ophthalmology, surgery and internal medicine. His favorite parts of being a veterinarian are the interactions with people, and the ability to use his knowledge and surgical skills to help people and their loving pets. As a boy living on a farm in Jet, Oklahoma, Dr. Smith helped his father with their animals. He remembers a cold, snowy night delivering pigs with his father as the moment that would motivate him to pursue a career in animal care. As he grew older, Dr. Smith worked for both large and small veterinary clinics. After high school, he attended Northwestern Oklahoma State University for two years before being admitted to the Center for Veterinary Health Science at Oklahoma State University. While at veterinary school, he was a member of the Society of Phi Zeta Honor Society. Dr. Smith completed his Doctorate of Veterinary Medicine in 1970 and interned at Colorado State University shortly thereafter. At home, Dr. Smith has a schnauzer named Zoe. He and his wife Michele, a retired high-school teacher, have two daughters named Shelli and Shannon. In his free time, Dr. Smith enjoys raising various crops and Angus cattle on the same ranch he grew up on. He's also a tennis player and a member of the Asbury Methodist Church. Suzanne Caruso was born and raised in Massachusetts. After graduating from Cornell University with a B.S. in Animal Science, she moved to Stillwater, Oklahoma to attend veterinary school at Oklahoma State University. Prior to attending veterinary school, Dr. Caruso worked in equine research studying the healing potential of omeprazole for equine gastric ulcers. Gastro Gard became an FDA approved drug in 1999 as Dr. Caruso was graduating with her D.V.M. Dr. Caruso has been practicing in the Tulsa area since graduating and prior to joining the River Trail family, she worked in critical care and emergency medicine at Oklahoma Veterinary Specialists. Dr. Caruso’s passions are internal medicine and ultrasonography. She has two daughters – Olivia (15 years old) is a nationally ranked high school wrestler and Eliana (8 years old) spreads her joy to all people and often spends time at River Trail loving on the rescue cats! Their family includes two rescue cats (Dorito, an orange tabby and Mira, black and white short hair). Her own cat, Dorito, holds the record of the longest foreign body that Dr. Caruso has ever removed surgically – a 45” ribbon! And that wasn’t Dorito’s only surgery – Dr. Caruso obtained Dorito as an owner surrender and that night removed a Cuterebra from her neck and then after the ribbon episode, Dorito had another foreign body surgery when she ate a plastic dog! Dorito is truly a feisty girl! Dr. Caruso is a member of Woodlake Church and when she is not in the clinic, likes playing outside with her girls and reading. Dr. Gisela Laisney was born in Buenos Aires, Argentina, and traveled the world as a young girl, living in a small town in the south of France for 6 years, as well as spending several years in Miami, Florida. Her family eventually relocated to Tulsa, Oklahoma when she was 11 years old and has lived here ever since. Dr. Laisney graduated with an Associate’s degree from the Veterinary Technician Program at Tulsa Community College in 2009 with honors. She earned her Registered Veterinary Technician license and practiced as an RVT while finishing her prerequisites at Northeastern State University to apply to veterinary school. She then earned her Doctorate of Veterinary Medicine from Oklahoma State College of Veterinary Medicine in 2016. While at veterinary school, she earned several awards and scholarships for her dedication to small animal medicine, and excellent academic standing. At home, Dr. Laisney has two rescue dogs- Gavin, a boxer mix and Millie, an Australian shepherd mix. She also has a tuxedo cat named Dexter and an orange tabby named Babou. Dr. Laisney and her husband Tom love to go camping, visit family across the globe, hike and ride motorcycles, and spending time with their newborn Hugo.